Probation violations can be very serious matters. Minor violations can result in jail terms and and major violations can result in prison terms being imposed. If you have been convicted or plead guilty to a criminal offense it is very likely that you were sentenced to serve a term of probation. For misdemeanors the length of probation is generally three years but may under certain circumstances be as long as five years. Most misdemeanor probations are informal, meaning there is no probation officer. But Judges and Prosecutors will sometimes require formal probation with supervision for as long as five years even with misdemeanors. Conditions of probation can be confusing and misleading and failure to follow the rules can have serious unintended consequences even to those who have the best intentions to comply. There are many deadlines and confusing timelines that create landmines for the uninformed citizen. A missed flight on a business trip could trigger a violation of an alcohol program rule which could result in a termination from the program which would trigger a probation violation which could land you in jail and cause you to lose the restricted license you got from the DMV for participating in the Program in the first place. It is important that you follow the court order to appear on your court date. A failure to appear could result in a bench warrant for your arrest. In some cases you may not receive any notification of your probation violation in the court you were sentenced. That does not mean there is no probation violation. You should check with the court clerk. 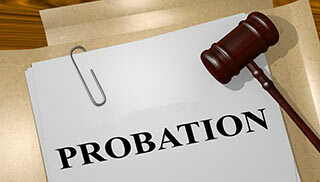 Some courts may not learn about the reasons for your probation violation until a later date. If you never checked with the court where you were originally ordered to serve probation, you may have a current warrant issued for your arrest. To assist you with this contact the Law Office of Barry T. Simons. Our attorneys and staff are familiar with the courts throughout southern California and will work to assist you on your possible probation violation. Just because you have a probation violation hearing does not mean you are going to be punished. If you are arraigned for a probation violation a judge will set a new date for a formal probation violation hearing. At this hearing, you will be allowed to present evidence and explain to a judge why you were not in violation of probation. There may be certain circumstances that need to be presented to a judge to explain why you could not complete a set of classes on time, or why you could not finish all of the community service you were ordered to do. Although, some of these excuses may be valid, some judges have a no tolerance policy for extension requests or for dismissing probation violations. At the Law Office of Barry T. Simons, we have experienced attorneys and staff that can prepare your case and consult with you to give you the best opportunity to avoid a probation violation and possible additional court penalties. For a free consult contact the Law Office of Barry T. Simons to assist you now. The punishment for a probation violation could depend on the number of previous probation violations, the type of new offense you received, or the type of probation you are on. Formal probation violations are usually more serious. You should contact your probation officer immediately for any possible probation violations. If you are found in violation of your probation the court has the authority to sentence you to the maximum punishment you were exposed to you when you plead guilty to the case that resulted in a term of probation. In rare circumstances a judge can order you to serve the maximum penalty. However, a judge does have discretion in how to sentence you for violating your probation. Having a knowledgeable DUI Attorney can make the difference between having to serve jail time or having creative alternatives to jail. For more information on possible probation violation punishment please contact the Law Office of Barry T. Simons.